Relive the highlights of the show, including the centenary celebrations and all the award winners. Chelsea 2013 marked the show’s centenary and the theme of ‘100 years of Chelsea’ was celebrated around the showground, from the displays and gardens through to large and small scale photographs showcasing memorable moments from the show’s history. Blackmore & Langdon celebrated 100 years of exhibiting in the Great Pavilion and received the President’s Award to mark this incredible achievement. Displays in the RHS Chelsea Florist and Young Chelsea Florist competitions, the floral arrangement classes and throughout the Great Pavilion commemorated 100 years of horticulture, whilst The M&G Garden captured the design trends of Chelseas past and present. Thousands of people voted for the Plant of the Centenary award from a shortlist of 10 – one for each decade that Chelsea has been held – which was won by Geranium Rozanne ('Gerwat'), renowned for its beautiful, violet-blue flowers. The Trailfinders Australian Garden presented by Fleming's received the Best Show Garden award with a design encompassing a studio space that looked like it was floating above the garden in a flower-like structure. This was Fleming’s last exhibit at Chelsea and the award was a fitting tribute to the striking and beautiful gardens they have staged at the show over the past few years. The Best Artisan Garden award went to the Japanese garden An Alcove (Tokonoma) Garden by Ishihara Kazuyuki Design Laboratory for their depiction of a traditional tatami room, and After the Fire by Scape Design took the Best Fresh Garden award with an interpretation of regeneration after a forest fire. In the Great Pavilion the Diamond Jubilee Award went to Warmenhoven for their stunning display of alliums and amaryllis. The Best RHS Environment Exhibit Award was made to the University of Nottingham for their display entitled “Food for the Future”. 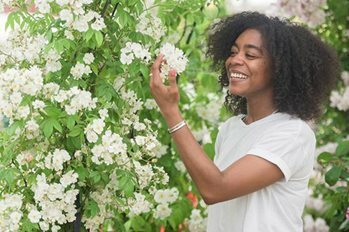 The title of RHS Young Chelsea Florist of the Year was awarded to Paula McLagan of Something Special Flowers and Laura Leong, Moulton College became the RHS Chelsea Florist of the Year. The RHS Chelsea Plant of the Year 2013 award went to Mahonia eurybrachteata subsp. ganpinensis ‘Soft Caress’ which was displayed on the Seeability show garden, grown by Van Son & Koot and supplied by Javado UK. Barbara Collier and Stephen McDonnell received the Best Floral Arrangement awards in sessions 1 and 2, and JAM Garden Design won the Fresh Talent competition with their Bird Columny display. Website visitors voted The Arthritis UK Garden the winner of the 2013 People’s Choice show garden award. Designed by Chris Beardshaw, the garden used planting and sculpture to reflect the impact of arthritis on sufferers’ lives. Le Jardin de Yorkshire was the 2013 RHS People's Choice for small gardens. Chosen from the Fresh and Artisan garden categories, this Artisan Garden depicted Yorkshire’s successful bid to host the 2014 Grand Départ of the Tour de France.